The Austrian composer Anton Bruckner is a complex and sometimes contradictory figure. Although his music is as richly Romantic as that of Wagner - and the two were firm and lifelong friends - in personality they could not have been more different, with Bruckner's mild-mannered, simple and self-effacing nature marking him out as unusual among composers. A devout Roman Catholic all his life, Bruckner initially found work as a church organist, and although he wrote little organ music, the influence of this experience on his compositional style is clear to the ear, with sudden changes of instrumentation in his orchestral works obviously derived from manual changes at the organ. His religious faith also drew from Bruckner some of his most beautiful small-scale works, Latin motets such as the beguilingly simple Locus iste and the dramatic Christus factus est, which have remained popular with church choirs both Catholic and Protestant to this day. He also drew on the Germanic tradition of the aequale, a short, homophonic and often funerary piece for trombones - writing two such pieces and also incorporating the accompaniment of trombones into some of his choral works, such as the majestic Ecce sacerdos magnus. A wealth of anecdotes attest to a man who earnestly sought recognition for his musicianship, yet was endearingly honest and free of guile, sometimes to the point of awkwardness (though always well-meaning - as when he enthusiastically tipped Hans Richter a small coin in thanks for a successful rehearsal of his Fourth Symphony, with the intention that he should buy himself a glass of beer). Curiously enough, Bruckner is one composer who can be said to have benefitted, albeit posthumously, from the development of improved recording technology - his symphonies are all extensive, large-scale works (many are over an hour long) and their popularity has increased since the introduction of longer-playing media. Sometimes unfairly dismissed as a second-rate, emotionally stunted version of Wagner, he is rightly revered for constructing musical works that have been compared to cathedrals of sound. You can view Presto's hand-picked selection of favourite Bruckner recordings here. James enjoys magnificently sonorous performances of two symphonies by Anton Bruckner. 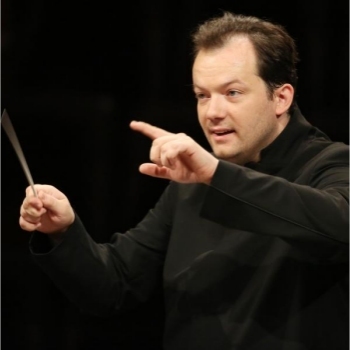 James listens to Andris Nelsons' first recording with the Leipzig Gewandhaus Orchestra - a stirring account of Bruckner's Third Symphony.